What impurities will Reverse Osmosis remove? Reverse Osmosis (RO) has become a common method for the treatment of household drinking water supplies. Effectiveness of RO units depends on initial levels of contamination and water pressure. RO treatment may be used to reduce the levels of: Naturally occurring substances that cause water supplies to be unhealthy or unappealing (foul tastes, smells or colors). Substances that have contaminated the water supply resulting in possible adverse health effects or decreased desirability. 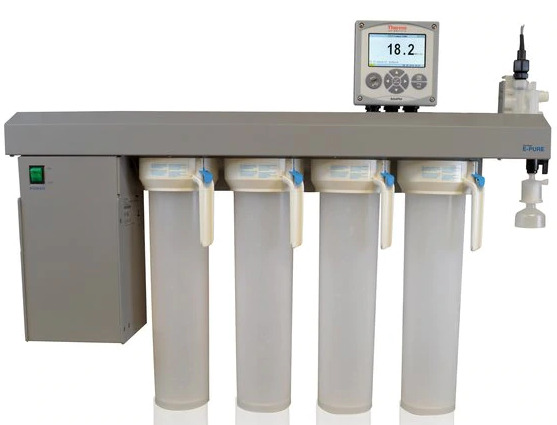 RO systems are typically used to reduce the levels of total dissolved solids and suspended matter. The principal uses of Reverse Osmosis in Minnesota and the Dakotas are for the reduction of high levels of nitrate, sulfate, sodium and total dissolved solids. RO units with carbon filters may also reduce the level of some SOCs (soluble organic compounds) like pesticides, dioxins and VOCs (volatile organic compounds like chloroform and petrochemicals). An RO unit alone may not be the best solution for these types of contaminants, but installing a properly designed RO unit to reduce the levels of other contaminants may provide a reduction in SOCs and VOCs. How to test your water; Before installing any water treatment system be sure to have the water tested. The test will identify the bacteria and level of minerals that are present. Interpretation of the test results will help determine whether treatment is needed and what type of system or systems to consider. The intended use of the water (drinking only, drinking and cooking, laundry, or all household uses) will also help determine the extent of treatment needed and the type of system to select. Note: RO systems are normally used to treat only drinking and cooking water supplies so may not be preferred where larger supplies are being treated. RO systems are not appropriate for treating water supplies that are contaminated by coliform bacteria. The water test analysis and interpretation will provide information about both naturally-occurring substances and those resulting from human activity. Treatment of contaminated water supplies should be considered only as a temporary solution. The best solution is to remove the source(s) of contamination and/or obtain a new water supply. As water gets colder it gets thicker. As water heats up it gets thinner. Like pass syrup though a screen, the water flow produced with reverse osmosis changes with temperature. All stated production flow rates assume a water temperature 77 F. As water gets cooler the production rate will drop roughly 3% per degree F of water temperature. As water increases temperature it will increase the production rate by 3% per degree of water temperature. The effectiveness of RO units is characterized by the rejection rate or rejection percentage. The rejection rate is the percent of a contaminant that does not move through, or is rejected by, the membrane. Some typical rejection rates for common contaminants are shown in Table 1. These rejection rates are for single contaminants under design conditions. *These values are for properly maintained units. Poorly maintained units will not be as effective at removing contaminants and, in the worst case, may not be removing any contaminants. Where water contains more than one contaminant, the rejection rate for each contaminant may be reduced or one of the contaminants may be reduced in preference to the other contaminant. For example, cases have been reported where water supplies containing either high TDS levels or high sulfates in combination with nitrates show no decrease in nitrates after treatment. (Nitrates as used in this publication refers to nitrate-nitrogen or NO3-N.) Rejection rates need to be high enough to reduce the contaminant level in the untreated water to a safe level. To determine the needed rejection rate, it is necessary to consider the initial concentration. For example, if a water supply contains nitrates at a concentration of 20 milligrams per liter (mg/l), an RO unit rejecting at a rate of 85 percent, which means 15 percent remaining, would reduce the level to 3 mg/l (20 times 0.15 = 3). Water with very high levels of nitrates (such as 100 mg/l) would remain near or above health standard levels even after treatment. Nitrate levels this high are not expected in this region and indicate unusual problems that require special investigation and handling. The National Sanitation Foundation (NSF) recommends that special designs be used for RO units where the NO3-N level exceeds 40 mg/l. Disadvantages of Reverse Osmosis units RO units use a lot of water. They recover only 5 to 15 percent of the water entering the system. The remainder is discharged as waste water. Because waste water carries with it the rejected contaminants, methods to re-cover this water are not practical for household systems. Waste water is typically connected to the house drains and will add to the load on the household septic system. An RO unit delivering 5 gallons of treated water per day may discharge 40 to 90 gallons of waste water per day to the septic system. What types of equipment make up an RO System? A typical home Reverse Osmosis treatment system is normally located beneath the kitchen sink since it is used to treat water for drinking and cooking purposes. RO systems consist of the pre-filter, RO membrane unit, a pressurized storage tank for the treated water, a post-filter and a separate delivery tap for the treated water supply. What are RO Stages and do they really mater? for that use because of the possibility of contamination through pinhole leaks or deterioration due to bacterial growth. 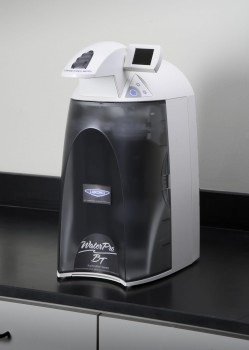 Water softeners are commonly used in Minnesota and the Dakotas in advance of the RO system. 1. Prefilter: The prefilter is sometimes referred to as a sediment filter. It removes small suspended particles to extend the life of the membrane. Some membrane units are damaged by chlorine and others by bacterial growth. Where chlorine is present, a carbon prefilter may also be recommended. 2. 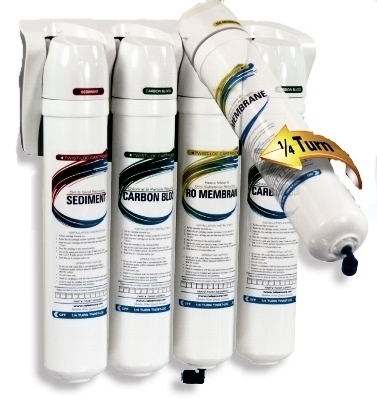 Carbon Filter : The carbon filter is used to reduce chlorine and other organic contamination in the water. It is important to change this filter often to all the R.O. Membrane to last as long as it should. Chlorine in water can rapidly fail as the chlorine begins to eat the membrane make the membrane holes larger. 3. RO Membrane: Several kinds of Reverse Osmosis membranes are available. The most common materials are cellulose acetate or polyamide resins. Mixtures or variations of these materials are also used. 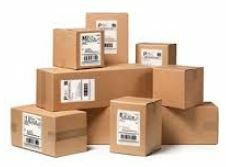 Each product has certain advantages and limitations and these need to be considered carefully. Some of the factors that should be investigated are: The contaminant(s) involved and their initial concentration(s). The water supply rate, or whether the system will deliver enough water to meet normal daily drinking and cooking requirements. The rejection rate, or the percentage of contaminants to be removed by the membrane. The water pressure required to meet the supply and rejection rates. That is, can this unit be operated on the normal operating pressure of a home water system or will a booster pump be required? How can the system's performance be monitored? That is, how can leaks or other problems be detected or how is the time for servicing or replacement determined? Some systems have built-in monitors, but many do not. Conductivity meters, pressure gauges and other devices can be used to detect problems where monitors are not included. Where coliform bacteria or other special contaminants are a known or suspected problem, periodic testing is recommended. 4. Storage Tank: Most RO units supply treated water at very low rates so a storage tank of 2 to 5 gallons is used to provide a suitable supply. These units are pressurized to produce an adequate flow when the tap is open. Under sink storage requires minimum pressure to deliver water. Other locations may require increased delivery pressure which may reduce membrane performance. 5. Post-Filter: The main reason for postfiltration is to remove any undesirable taste and any residual organics from the treated water. Usually a carbon filter is used for this purpose. Where a carbon filter is used as a part of the prefiltration step, postfiltration is normally eliminated. 6. Delivery Tap: A separate delivery tap for the treated water is used so that both treated and untreated water are available. 7. Other: No special controls are required on most systems since they operate by the use of pressure-sensitive switches, check valves, or flexible bladders. Shut-off valves are important to conserve water during low use periods. Monitoring gauges or servicing lights are becoming increasingly common and assist greatly in knowing whether the system is or isn't working. What does an RO System cost? When deciding on a water treatment system be sure to investigate all options and all costs. To compare purchase to lease or rent options consider the following: Initial Costs of the System; Be sure that all parts are included, especially when comparisons are being made. 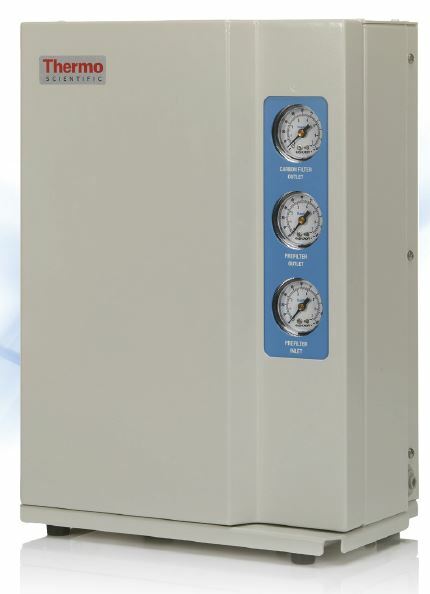 RO units range in cost from $300 to $3000 and vary in quality and effectiveness. Replacement membranes cost $100 to $200 and filter cartridges around $50. Installation Costs: These costs are generally the responsibility of the purchaser, but who pays installation fees when renting or leasing? Is there enough space to accommodate the system being considered or will some modifications of space be needed? Operating and Maintenance Costs: Electricity to pump the water is the only significant operating cost. Filter cleaning and/or replacement (both pre and post-filters) and RO membrane replacement need to be estimated. Whether routine maintenance can be done by the owner or requires special service is important information when purchasing a system. 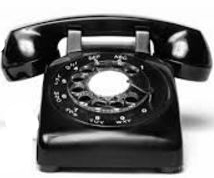 When renting or leasing, how and when servicing is to be done and who pays for the supplies and service needs to be clearly stated. For example, is the service done on a schedule or an "as needed" basis? 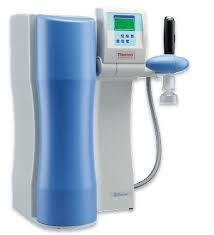 Summary Reverse Osmosis is a proven technology that has been used successfully on a commercial basis. One of the better known uses of RO is the removal of salt from seawater. Household RO units typically deliver small amounts (2 to 10 gallons per day) of treated water and waste 3 to 20 times the amount of water treated. Reverse Osmosis units remove many inorganic contaminants from household drinking water supplies. The removal effectiveness depends on the contaminant and its concentration, the membrane selected, the water pressure and proper installation. RO units require regular maintenance and monitoring to perform satisfactorily over an extended period of time. Before purchasing an RO unit or any other water treatment equipment, purchasers should test their water to be certain that treatment is needed and that the equipment being selected is appropriate to the problem requiring treatment. All costs need to be considered when comparing competitive systems and when making purchase or rental decisions.